What does it mean to be middle class in the contemporary city? What do the middle classes do to these cities and what do these cities do to middle class identity? Do the middle classes engage in social mix or do they seek out 'people like us'? How much do middle-class attitudes and activities vary by neighbourhood as well as across two global cities? 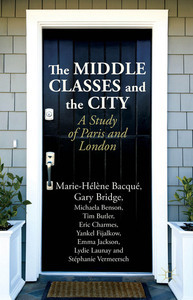 Based on a large comparative study of different types of neighbourhood (gentrifying and gentrified inner urban, suburban, exurban and gated communities) in both Paris and London, The Middle Classes and the City explores how class intersects with gender, ethnicity, and intergenerational relations in the fragmentation of middle-class lifestyles, as well as identifying their common practices (especially in relation to schooling and gender divisions of labour). It suggests that localized neighbourhood activities, as well social interactions and mobilities across the city as a whole, are used by the middle classes to manage social mix and social reproduction, involving different degrees of competition and compromise.